MDG now includes a real installation program. The installation program will automatically verify that all of the required components (Microsoft .NET Framework 4.5 and Microsoft SQL Server Compact 4.0) exist. If a required component doesn't exist, the installation program will download and install it. MDG now includes a user interface. The user interface simplifies the setup process and makes interacting with MDG easier. The Project List is the main form. This form displays the current status of every project and is used to perform project maintenance (new, edit, delete). New Project: displays the Project Maintenance with a new project. Edit Project: displays the Project Maintenance form for the selected project. Delete Project: permanently deletes the selected project. The Project Maintenance form is used to define the project settings. This form includes the ability to test the settings and to perform the Meta Data Class generation process. Project Settings: all settings are required. Database Settings: all settings are required. Class Settings: all settings are required. The Project and Database settings include a Test button. 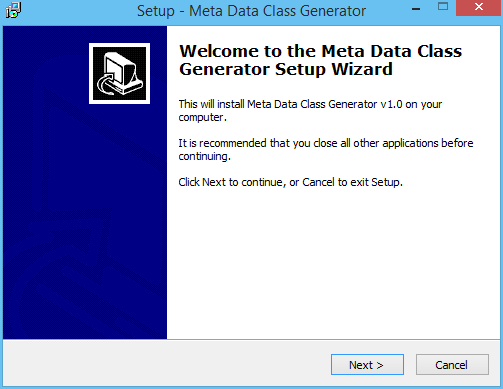 The Run button is used to perform the Meta Data Class generation process. 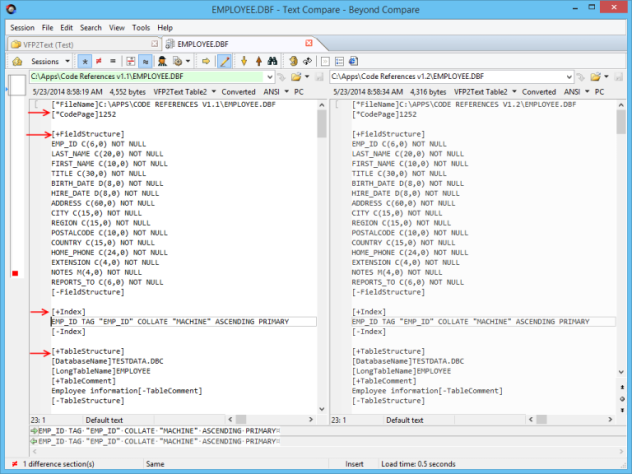 MDG now stores the project information in a SQL Compact 4.0 Database. The database is located in the Common Program Data folder. 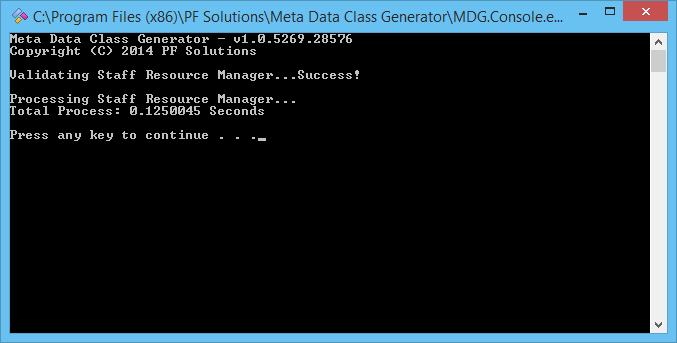 On a Windows 7 PC, this equates to C:\ProgramData\PF Solutions\Meta Data Class Generator\. 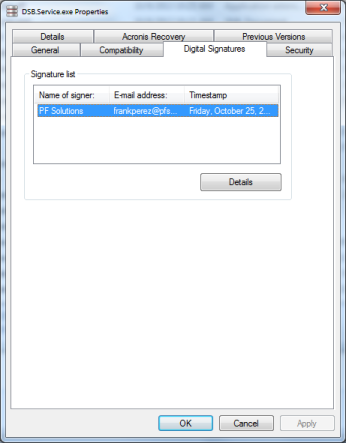 All of the MDG EXE and DLL files are now digitally signed. FMG now includes a real installation program. The installation program will automatically verify that all of the required components (Microsoft .NET Framework 4.5 and Microsoft SQL Server Compact 4.0) exist. If a required component doesn't exist, the installation program will download and install it. FMG now includes a user interface. The user interface simplifies the setup process and makes interacting with FMG easier. The Project Maintenance form is used to define the project settings. 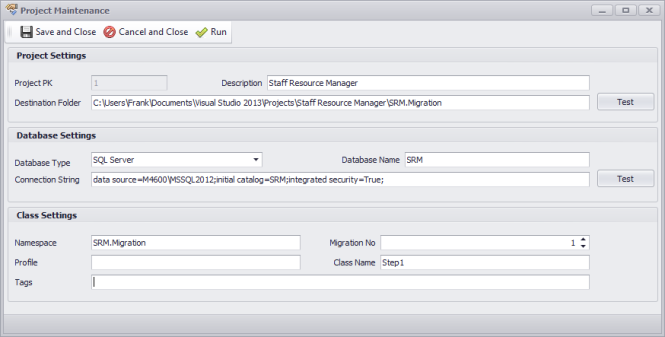 This form includes the ability to test the settings and to perform the Fluent Migrator Class generation process. Project Settings: Description and Destination Folder are required. 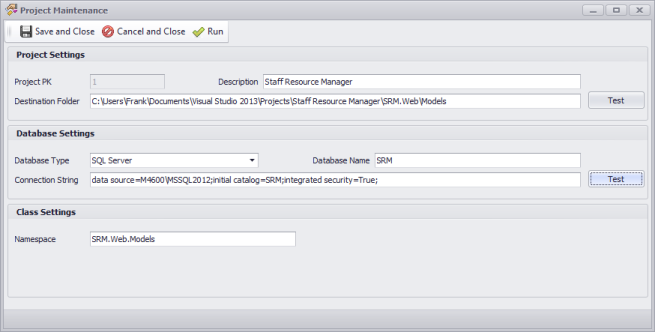 Class Settings: Namespace, Migration No, and Class Name are required. 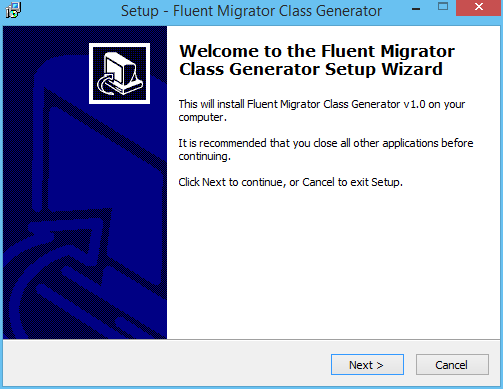 The Run button is used to perform the Fluent Migrator Class generation process. FMG now stores the project information in a SQL Compact 4.0 Database. The database is located in the Common Program Data folder. On a Windows 7 PC, this equates to C:\ProgramData\PF Solutions\Fluent Migrator Class Generator\. 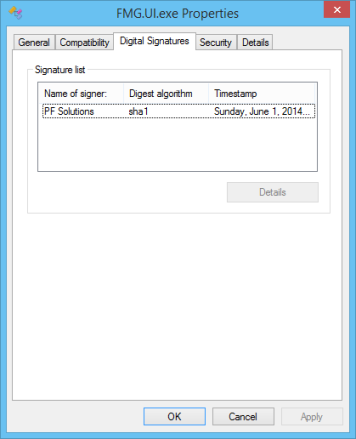 All of the FMG EXE and DLL files are now digitally signed. Back in 2008 the first version of VFP2Text was initially released. I was immediately surprised by how many people liked it. Sometimes an idea seems really cool to you, but it's hard to gauge what others will think. 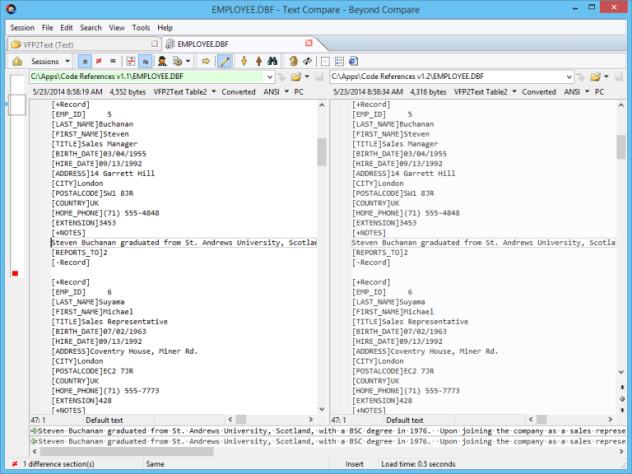 For the sake of those who are new, Beyond Compare is a tool for comparing folders and files. VFP2Text is an add-on utility for Beyond Compare that allows Beyond Compare to perform comparisons on Microsoft FoxPro binary files (DBC, DBF, FRX, SCX, and VCX). Three years later, VFP2Text v2 was released which added support for Beyond Compare v3 and a couple of minor adjustments. At that time I attempted to add Merge capabilities, but I was never able to get it to work well. Which explains why I never blogged about VFP2Text v2. After six years of near silence, I'm proud to release the next major version of VFP2Text with some very cool features. VFP2Text now includes a real installation program. 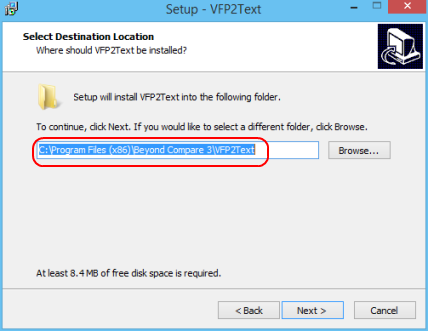 The installation program will automatically locate the folder where Beyond Compare is installed and then install VFP2Text into a sub-folder. VFP2Text can now automatically update the Beyond Compare File Formats. This simplifies the setup process and makes getting started with VFP2Text easier. 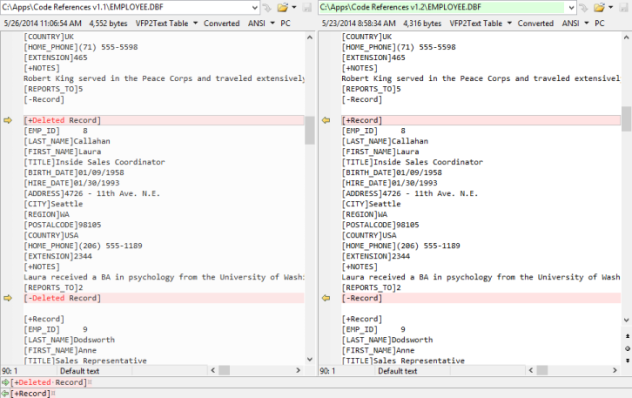 The previous versions of VFP2Text used the CURSORTOXML() function to convert FoxPro binaries to XML. XML was chosen because it is very easy and fast to create, and XML automatically handled MEMO fields. 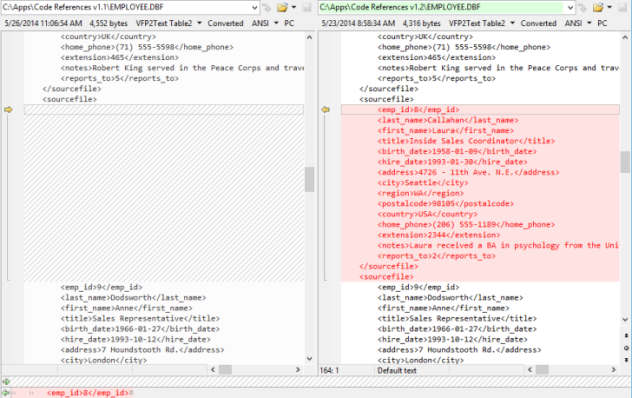 One of the problems with the XML format is that Table Structure was very verbose and difficult to read. 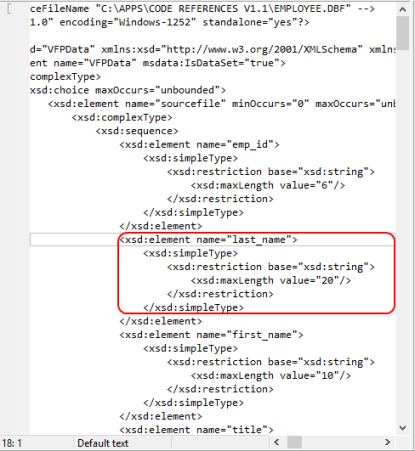 Another problem with the XML format is that it converted special characters, such as the lessor than and greater than signs. VFP2Text v3 manually converts every field to plain text in a custom format that is easier to read. VFP2Text v3 includes the entire table structure (code page, fields, indexes, database name, and etc). VFP2Text v3 automatically handles special characters. The previous versions of VFP2Text ignored deleted records. This made sense for FoxPro source code (e.g. FRX, SCX, and VCX) files, but was not always the desired behaviour for DBF files. VFP2Text v3 includes deleted records when DBF files are processed. FoxPro binary files mostly come in pairs. 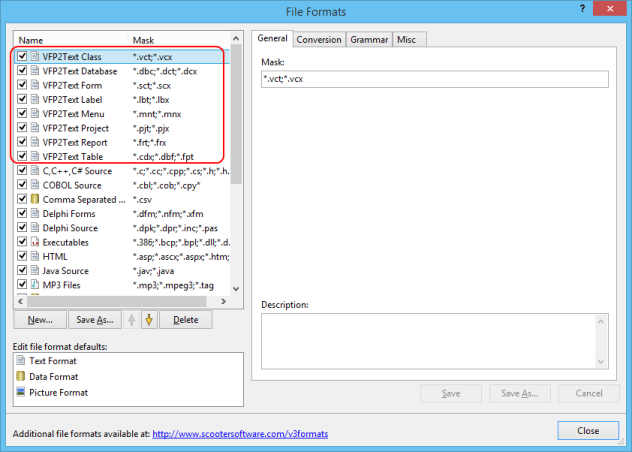 For example, a Report consists of a FRX and a FRT file, whereas a Form consists of a SCX file and a SCT file. Because there is no way for VFP2Text to know which file in a pair will get passed to it (sometimes both, sometimes just one), VFP2Text has to perform the conversion process for either file in a set. That is why the File Formats has multiple extensions. 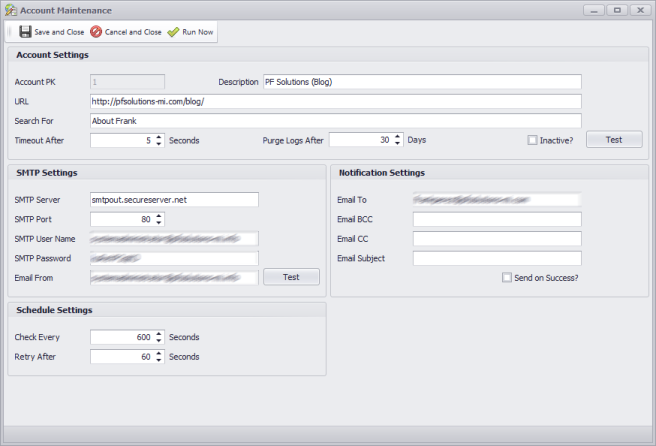 VFP2Text v3 saves time by caching the last 30 seconds of conversions. For example, once the CDX has been converted to plain text, VFP2Text uses the cache for the corresponding DBF and FPT files. The VFP2Text.EXE and Setup*.EXE files are now digitally signed. Two and half years ago I released the first version of the WSM (Website Monitor) application. In that time I have received some good feedback and have enjoyed working on this project. 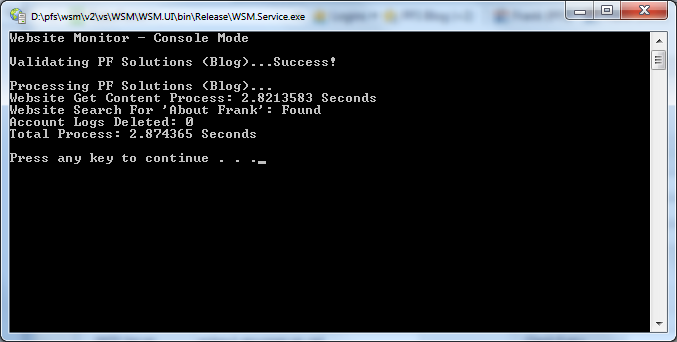 Today I'm proud to release the next version of WSM with some very cool features. WSM now includes a real installation program. The installation program will automatically verify that all of the required components (Microsoft .NET Framework 4.5 and Microsoft SQL Server Compact 4.0) exist. If a required component doesn't exist, the installation program will download and install it. WSM now includes a user interface. The user interface simplifies the setup process and makes interacting with WSM easier. The Account List is the main form. This form displays the current status of every account, is used to perform account maintenance (new, edit, delete), and access the logs. Start: starts the service in the Service Control Manager. Stop: stops the service in the Service Control Manager. 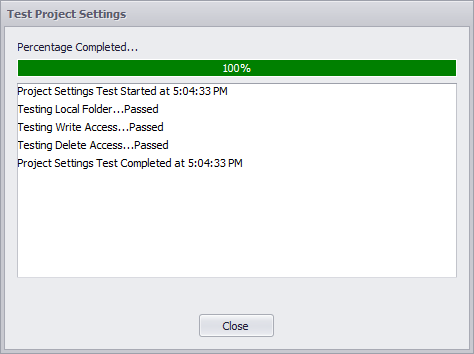 Restart: restarts the service in the Service Control Manager. Install: installs the service in the Service Control Manager. Uninstall: uninstalls the service from the Service Control Manager. New Account: displays the Account Maintenance with a new account. Edit Account: displays the Account Maintenance form for the selected account. Delete Account: permanently deletes the selected account and all of the corresponding logs. Account Logs: displays the Log List form for the selected account. Import Accounts: creates accounts by importing settings from WSM v1. The Account Maintenance form is used to define the account settings. This form includes the ability to test the settings and to manually perform the website check process. Account Settings: Description, URL, and Timeout After are required. Schedule Settings: all settings are required. 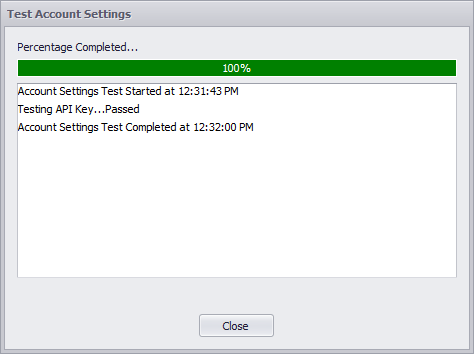 The Account and SMTP settings include a Test button. Keep in mind that if you run WSM as a Windows Service, the credentials you test with could have different rights than the Windows Service. The Run Now button can be used to manually perform the website check process. The Log List form displays the account logs. WSM now stores the account information and logs in a SQL Compact 4.0 Database. The database is located in the Common Program Data folder. On a Windows 7 PC, this equates to C:\ProgramData\PF Solutions\Website Monitor\. All of the WSM EXE and DLL files are now digitally signed. It has been over two years since I released the first version of DSB (DiscountASP.NET SQL Backup). In that time I have received some good feedback and really enjoyed working on this project. Today I'm proud to release the next version of DSB with some very cool features. DSB now includes a real installation program. The installation program will automatically verify that all of the required components (Microsoft .NET Framework 4.5 and Microsoft SQL Server Compact 4.0) exist. If a required component doesn't exist, the installation program will download and install it. DSB now includes a user interface. The user interface simplifies the setup process and makes interacting with DSB easier. Import Accounts: creates account by importing settings from DSB v1. The Account Maintenance form is used to define the account settings. This form includes the ability to test the settings and to manually perform the backup process. Account Settings: Description and API Key are required. Database Settings: Backup Type and Database Name are required. 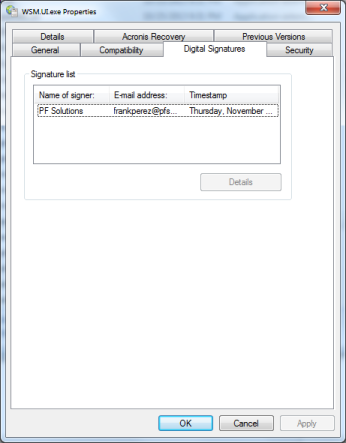 FTP Settings: FTP Folder, FTP User Name, and FTP Password are required. Local Folder Settings: Local Folder is required. The Account, Database, FTP, Local Folder, and SMTP settings include a Test button. Keep in mind that if you run DSB as a Windows Service, the credentials you test with could have different rights than the Windows Service. 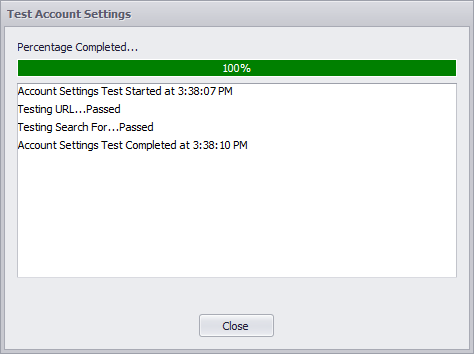 The Run Now button can be used to manually perform the backup process. DSB now includes the ability to schedule when and how often the backup process is performed. Keep in mind that these settings only apply if DSB is ran as a Windows Service. Also, DiscountASP limits how often a backup can be performed. The current limit is once every 6 hours. 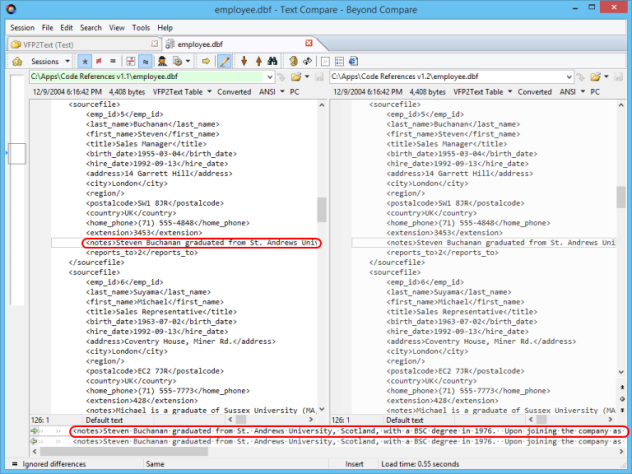 DSB now stores the account information and logs in a SQL Compact 4.0 Database. The database is located in the Common Program Data folder. 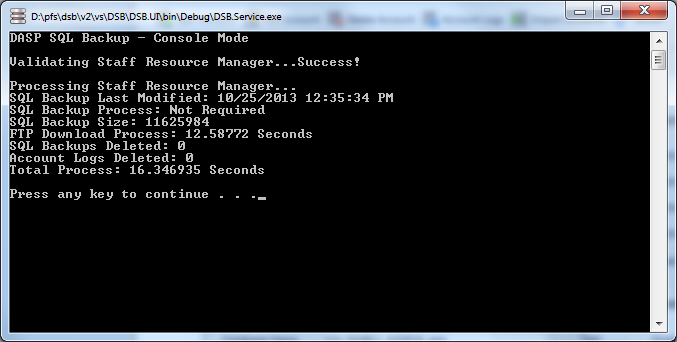 On a Windows 7 PC, this equates to C:\ProgramData\PF Solutions\DASP SQL Backup\. All of the DSB EXE and DLL files are now digitally signed.